The world of shutters is varied with such a wide range of information available it can be difficult to know what to choose. Here we try and make things a little simpler to help you choose the right plantation shutters for your home. The most popular colour is silk white for interior shutters. We offer two ranges; the Hampton and the Nevada. The Hampton range is a faux wood shutter manufactured from high quality HS Polyvinyl. Available in 18 colours: 2 whites and 16 colours to enhance the beauty of your interior. Hampton is offered in 3 Louver sizes; 63mm, 76mm and 89mm. Suitable for most window designs, Hampton is very durable and waterproof. It offers superior insulation values. The Nevada is a faux wood shutter manufactured from high quality HS Polyvinyl. The Nevada collection is Santa Fe Shutters’ most popular range. Nevada is available in 9 colours; 5 whites and off whites; Vivid White, Bright White, Silk White, White and Ecru along with 4 neutral and grey tones; Phantom, Moonlit, Lunar and Armory. There are 4 louver sizes offered; 63mm, 76mm, 89mm and 114mm. Suitable for most window designs, Nevada is durable and waterproof with superior insulation values and a 10 year-warranty. There are several different plantation shutter styles to accommodate the variety of window types. There is a shutter style to suit, whether you have a standard casement window, square bay, patio doors, traditional sash window, or, one of the more complex designs of French doors, multi-paned bays, unusual shapes or large-size track requirements. The standard style of window easily accommodates a basic design of shutter. Often this comprises of a set of panels to match your window layout, hinged in a 4–sided frame for ease of fitting. The more complex window styles often involve angled or curved shutters. 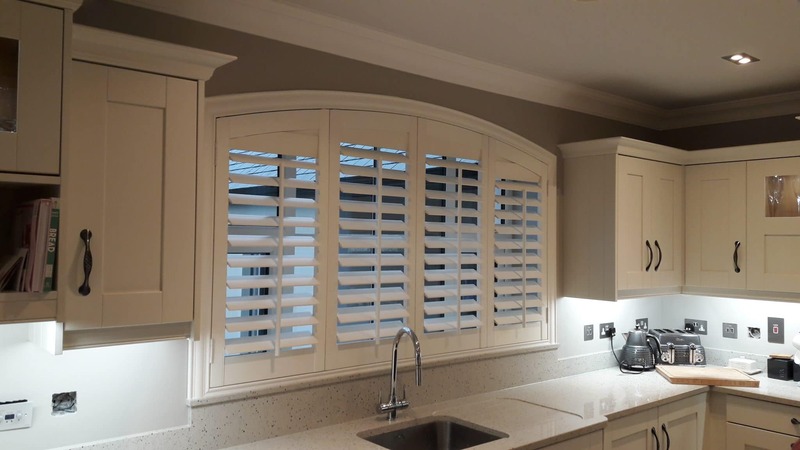 These shutters normally require templates or detailed drawings, but with an expert available on the telephone helping you all the way, even the most inexperienced home improver can obtain a professional finish. Full-height, with the option of horizontal middle rails should you require movement within independent sections. Top-opening, also known as tier-on-tier, providing a choice of opening sections. Half-height, also known as café style, which fit only a fraction of the way up a window leaving the top section fully open. Shutters can also be made to suit bespoke shapes, allowing for curves, arches and angled designs. For wide-openings, it is more likely that a Track system will be required. The shutters hang from an overhead track in order to support their weight. There may be an option to either fold these to the side via bi-folding pairs or slide behind one another into a compact section to one end of the track. The market provides many different materials and too many negative appraisals just to suit those companies’ own products. An expert’s advice is crucial and neglecting to seek it can be very costly. For example, whilst certain woods look fantastic, they may be totally unsuitable for a kitchen or bathroom where there is high humidity and a tough durable product providing a water-resistant finish would be far more suitable! Duffy’s have tried to select a range of products so that we have the right product for each window. Plantation shutter panels have movable horizontal slats, known as louvres/louvre blades that rotate to allow the louvres to open for access to light and visibility, or shut to reduce light and gain privacy. Louvres are available in four sizes and the size can be selected depending on the size of the room and shutter. The larger the blade the more light will be allowed into the room. Most people opt for the 89mm size. What Is A Duvet And Duvet Cover?